Though it resembles a cake like its name suggests (tarta=cake), this stack of savory ingredients is decidedly un-sweet. And the vegetable part? Yes, there may be shredded lettuce, tomatoes, and chopped corn and carrots mimicking sprinkles on top of the mayonnaise “icing,” but the bottom layer is unabashedly made up of tuna! 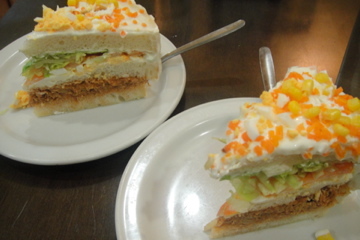 The tarta is most similar to our triple-decker club sandwiches offered at diners, but in the fancy dress of a cake. It is one interesting trampantojo! The transition back to work is always difficult after a good break. When I asked the teachers at my school about their breaks, they invariably answered “It was too short!” Seems to be a sentiment felt around the world!